THE Mines Inspectorate of the Mineral Resources Authority granted RamuNiCo Management (MCC) Ltd, the manager of Ramu Nickel/Cobalt project regular operation permission on Thursday, July 21 following the conditional permit since the commissioning of the Project. The Inspectorate also issued order for the restart and operation of HPAL (high pressure acid leach) Train Three at Basamuk Refinery and the relaxation of cessation order of blasting of limestone at the BasamukRefinery limestone quarry. The Mines Inspectorate initially ordered for the temporary shutdown of HPAL Train Three on April 15 following a fatality at Basamuk Refinery on April 12. However, the train will now operate in parallel with Train One and Train Two. RamuNiCo’sBasamuk Refinery Deputy General Manager, Adam Lukey in making the announcement said this is a very positive step and a monumental day for the company. 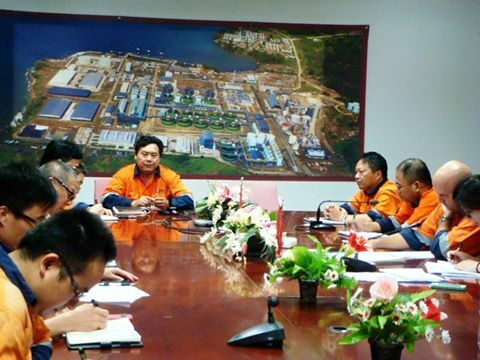 The announcement was made in the presence of RamuNiCo President, Mr. Wang Jicheng and vice presidents at Basamuk Refinery, which was watched simultaneously via video conference in Madang and Kurumbukari Mine. Mr. Lukey said the conditional approval requires the company to fully attend to the conditions specified in several reports including Third Party Investigation Report, HPAL Train One and Train Two Safety Report and HPAL Train Three Incident Investigation Report that was submitted to the Inspectorate. “We need to continue our assurances and our commitment from senior management and the refinery teams to take all the necessary measures to ensure health and safety of all persons at the refinery,”Mr. Lukey said. RamuNiCo (MCC) President, Mr Wang Jicheng in acknowledging the approval order stated that, although the fatal incident of April 12 at the refinery is serious it is also a lesson to learn from. Mr. Wang said the management must change the progress load efficiency style to push forward the management to a higher safety standard. He further stated that although the Company had been issued orders, there are still a lot of rectification works to be done and tasked the Basamuk Refinery management team to interpret the Conditions and reach a consensus with the management to push forward all the rectifications based on the priority items. The president also stressed the fundamentals of management and urged all managers to create positive atmosphere in their respective work places so all employees can follow the good practices. “Good work environment shapes people’s personality,” Mr Wang stated.